Painting Borisov-Musatov "Water" created at the most happy time for him. The woman he loved for many years, his future wife, the artist Elena Alexandrovaanswered him "yes." 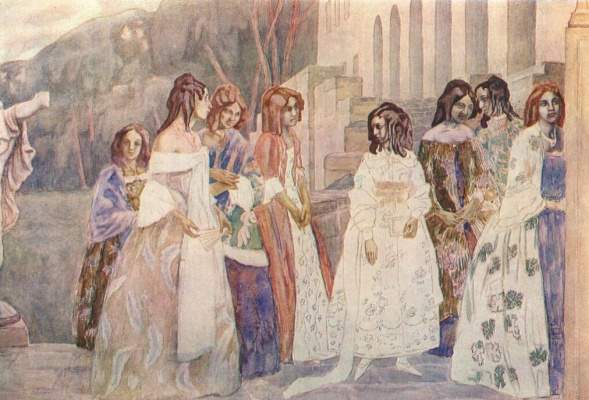 The idea of the painting originated in Zubrilovka, the favorite artist's estate of Princess Prozorova-Golitsyna. He spent the summer there with his closest people - sister Lenaand future wife. We have two girls in front of us: the artist's bride sits on the shore, his sister stands nearby. The calm and motionless surface of the lake is an artificial reservoir, a swimming pool, which at that time was a miracle of hydraulic engineering. 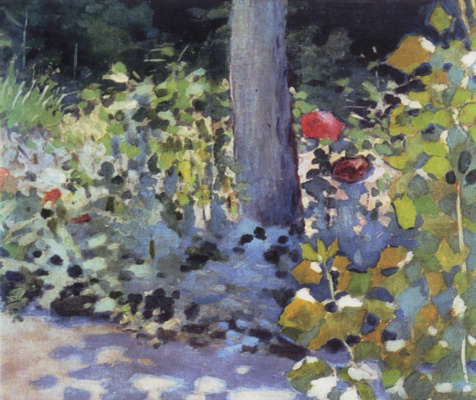 Pond made in the form of an ideal oval, Borisov-Musatov in general, to this geometric form. 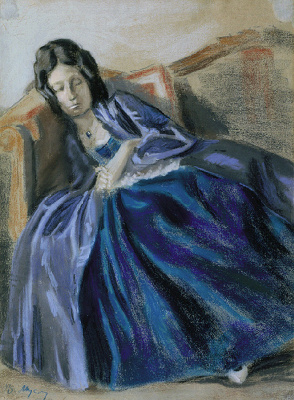 The oval is repeated in the folds of the dress of the sitting girl, and the folds themselves resemble the waves and contrast with the surface of the water. 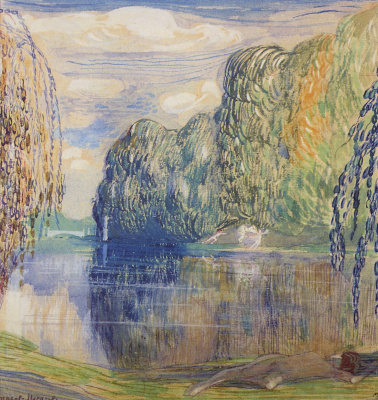 Vertical reflections of trees come into a rhythmic overlap with the figure of a standing girl. The artist surprisingly plays with the plans of the images: the girls are written as if close, and we see the reservoir as if from above. Due to this, with a general view, it is not the picture that the reservoir seems to be set vertically and literally a mirror. But it is not the girls that are reflected in it, but the landscape. We, in fact, see it exclusively in reflection. The artist completely neglected the horizon line, using this reflection instead. Thus, the viewer is deprived of any reason to especially believe in the “real world”, his world of reflections overshadows. There may even be a feeling that we have the underwater world, and not the surface one. 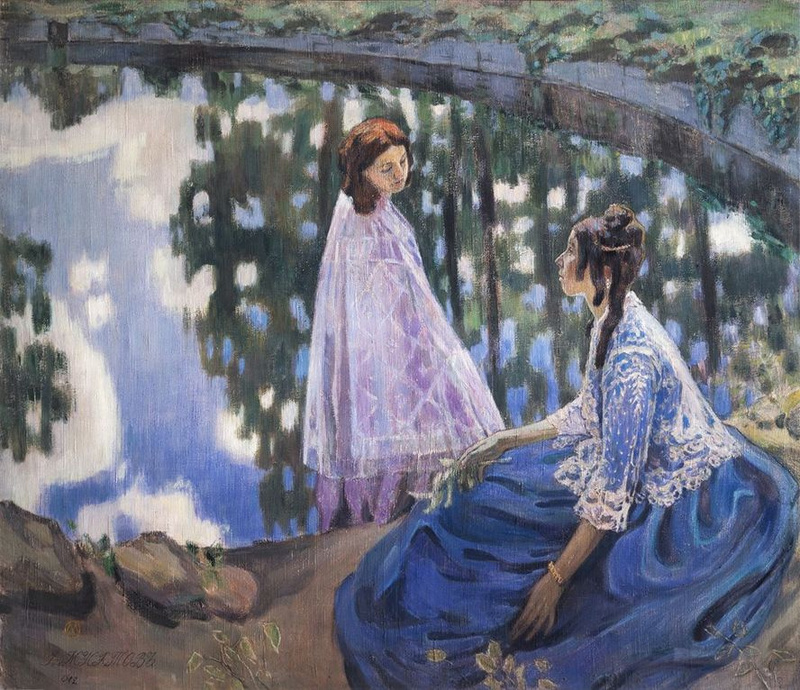 The deep blue colors of the dress of the seated heroine echo the reflection of the sky in the water, and the light white lace capes - with the reflected clouds. 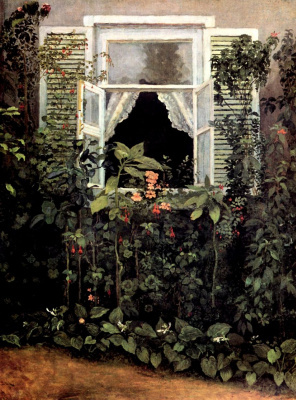 The poetic mood of the picture corresponds to the large size of the canvas. Special facial expressions, generally characteristic of women in the paintings of Borisov-Musatov, create a feeling of a certain detachment from everyday life, elevation. 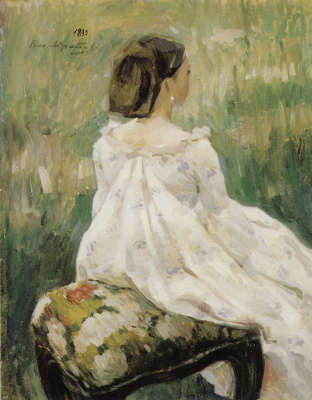 The seated girl looks away into the distance with a questioning gaze, her face standing down and as if hidden in misty bliss. Harmony and absolute beauty. There is no need to call for a wonderful moment to stop; it already stands still on this canvas. The fullness of happiness, the fullness of being and the poetry of life are reflected in this reservoir. And the reservoir itself is reflected in the heroines of the canvas. One of the leading ideas of the philosophy of Borisov-Muchatov is the doom of Beauty, if there are no those who are able to reflect it. Here we have three infinity, mutually reflecting each other, forming a circular trinity: the depth of the reservoir, the infinity of the sky and the beauty of man, Eternal femininity. 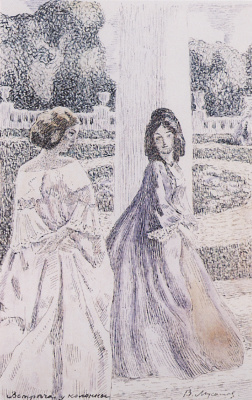 Borisov-Musatov did not admit to anyone that he had planned for the picture - only these two women knew about her. From the letter to the future spouse: “I will write this picture now or never ... After all, after another life begins. Everything will seize me, probably in a different form. And I want the glory of this picture ... to be your wedding gift. ”. As for fame, he truly anticipated: this picture drastically changed the attitude of critics, viewers, and fellow artists to it. When he showed the picture to his friends, even before the official presentation of it at the exhibition, they were silent for a long time, dumbfounded, bewildered, entranced by the spectacle presented to them. Finally, someone could not resist: "How good ... God, how good ...". The public saw the “Waterway” at the beginning of 1903 at the exhibition of the Moscow Association of Artists. 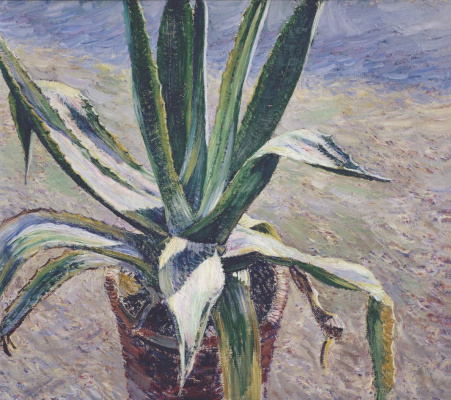 It was obvious to all that this work was a special phenomenon in Russian painting. 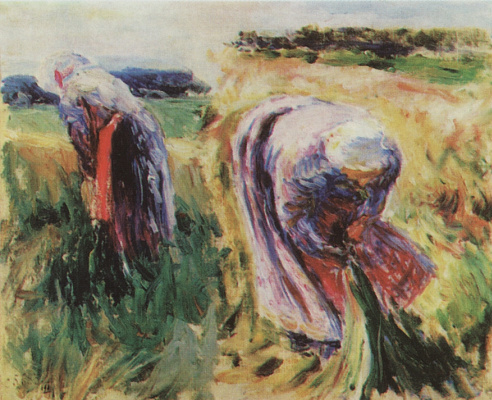 She was immediately acquired by a family of Moscow collectors - Vladimirand HenriettaHirschmans. In 1917, they transferred this picture together with many others to a temporary, as it seemed, overexposure, collection of the Tretyakov Gallery. When the Gershmans left, the “Pond” remained in the meeting of the Tretyakov Gallery, where it still remains today.